Acorn Tree Services are a specialist tree services company. We cater for an array of jobs from minor garden trees to fully grown mature trees. Acorn Tree Services are based in Co. Laois but also service areas in Kildare, Offaly, Wicklow, Carlow and Kilkenny. Having been in business for over 15 years, you can rest assured that you will receive a service that is of the highest standard with a personal customer experience. Acorn Tree Services Ltd We will offer the client guidance on garden upkeep and undertake the customer’s needs. We have expertise in recognising and controlling hazardous trees. All of our prices our very competitive while our service is very competent. Why not call us today to see how we could help you with any requirement you may have. Here at Acorn Tree Services, we love trees. They are an integral part of our terrestrial ecosystem providing forest and habitats for a vast array of communities and organisms. They remove carbon dioxide from the atmosphere; trees provide a habitat for a multitude of species and plants. They provide shade and shelter, fuel for cooking and eating. Trees provide us with fruit for food and timber for construction. We believe in the safe maintenance and removal of trees for our customers. After being in business for over 15 years, Acorn Tree Services has amassed a reputation for completing works to the highest standard with an engaging customer experience that is bespoke. Our clients include works for commercial and residential dwellings as well as the Laois County Council and ESB. 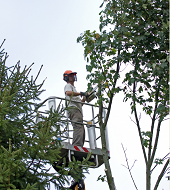 Acorn Tree Services staff are NTPC certified and have been trained by Tree Care Ireland. We are fully insured, including Public Liability Insurance; giving you have peace of mind that any services you require will be carried out professionally and with due diligence. Let Acorn Tree Services assist you in your tree service requirements today. We are passionate about customer service and consistently engaging with our clients to constantly improve our services. Why not give us a call today top see how we can assist you with any tree servicing requirements you might need. Nature can be unpredictable. Acorn Tree Services offer 24/7 emergency support for the removal of fallen or hazardous trees. If you find yourself in need of emergency services, please don’t hesitate to give us a call. Our expert staff is on hand to assist you with any request you may have. Crown Reduction: Reducing the crown of the tree without spoiling its shape. Allowing for more wind to pass through the tree, reducing the possibility of it being knocked over. Crown Reduction allows for more light to pass through the tree. Crown Reduction will result in a healthier and safer tree for your home. Deadwooding: Removing dead, diseased, broken or weakly attached branches to the tree. Pruning: Removing obstructing lower branches and thinning of the crown to permit new growth and better circulation. Different plants require different pruning. If you require an assessment or any advice on a tree in need of maintenance or even a potentially dangerous tree at your home or residence, just give us a call. We’d be more than happy to give you a consultation and help put your mind at ease. Removal of weeds and woody shrubs for new site development. Acorn Tree Services offer a full tree planting and consultation service for Beech, Oak, Ash, Sycamore and a host of other breeds and sizes. All our trees and greenery are locally sourced. We’ll after all of the logistics around permits and the safe removal of dead or potentially dangerous trees at your home or residence. We’ll look after the safe and ecological disposal of your trees once the job is done with our wood chipping service. Let Acorn Tree Services look after all your maintenance requirements with our bespoke cutting service. WE trim and top all kinds of hedges. Call us now for a consultation. There is no job too big or too small. Acorn Tree Services specialise in the removal of tree stumps beneath ground level. A fireplace is the focal point of any living space; creating a sense of home and warmth. A fireplace creates an elegant environment for entertaining or gathering around with the family. Acorn Tree Services responsibly dispose of all our green waste through our wood chipping and recycling service. Acorn Tree Services also offer a firewood sales service keeping you warm and content throughout all the seasons. Purchasing small amounts of firewood can become a costly and an ultimately inefficient financial endeavour. Why not stock up for the season with our firewood sales service. Lighting a fire is a great way to save on energy bills. Wood fires offer a greater heat output and burn slower, resulting in a more cost effective heat source and they also look great. We specialise in selling the finest hardwood firewood ideal for wood burners and fireplaces. We offer competitive pricing to cater for every price point. Our firewood comes conveniently packaged. We also offer a local delivery service to the greater Laois area. Call us now to find out how we could help you today. Let our expert staff advise you on all your firewood requirement to keep you warm and relaxed this season. Call Acorn Tree Services now to see how we could help you with any tree services you may require.